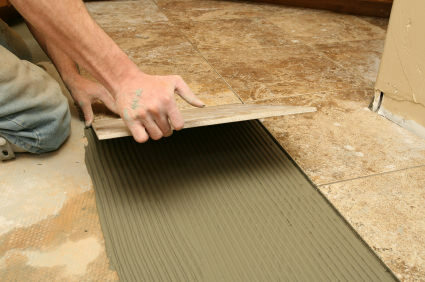 Hard tiles must be laid on as flat a surface as possible, so we make sure that the surfaces are perfectly flat. If the surface is concrete floor, a self-leveling compound will be applied, if the surface is a wooden floor, covered with floorboards, this will be covered with a 19-mm ply sub-floor. On wooden floors, our tilers uses flexible adhesives and flexible grout but for certain types of tiles, flexible adhesive and flexible grout is necessary on all floor types.